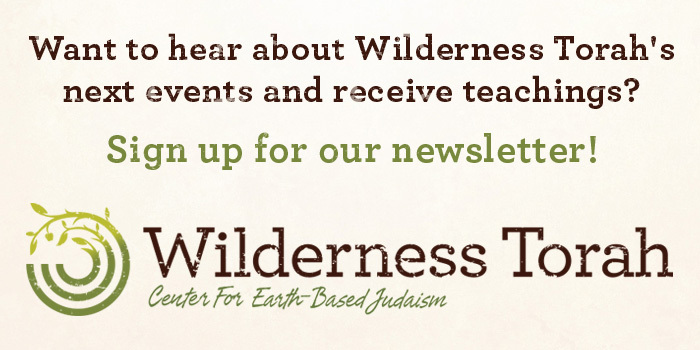 Since 2007, Wilderness Torah has offered an annual cycle of experiential land-based festivals. There, we gather as a pluralistic, multi-generational community to celebrate the seasons and Jewish traditions in their original nature-based context. Passover in the Desert is a five-day gathering in the Southern California desert wilderness, celebrating freedom and awakening. We create a rustic village where we immerse ourselves in the Exodus experience. Divided into small tribes (intimate groups led by experienced guides), we co-create the physical village, the spirit of community, with meaningful Shabbat and Passover ritual. On the seventh day and culmination of the festival of Sukkot, join Wilderness Torah as we celebrate Hoshana Raba (the Great Pleading). Together, we will rejoice as a community and give gratitude to the earth and Spirit for a blessed year and the coming rains. Our Sukkot In-Gathering celebration will be a daylong event filled with fun for the whole family! In the spirit of revelation and the mysteries that show themselves in the dark of the night, Wilderness Torah will be hosting an overnight fire, in collaboration with JCC for their Tikun Leil gathering. There will be singing, study, embodiment, and lots of fun educational material. To celebrate Tu B’Shvat, Wilderness Torah offers a daylong gathering where we participate in an experiential Tu B’Shvat seder, modeled after the mystics of Tsfat, Israel, designed to connect us directly to the elements to celebrate the awakening of the trees. I have attended three events: Sukkot, Passover, and TuB’Shvat. Each time, I have further deepened my connection between Judaism and Imma Adamah, our Mother Earth. Wilderness Torah’s leadership is both inspired and grounded.